A typical sleep cycle here at Chez T will involve me heading to bed before The Management. See, she’s much more of a night owl than I am. I like to get to bed and accomplish things in the morning. I think I feel that if I get something done in the morning, I won’t feel unproductive through the rest of the day. As many know, I’ve been working at cleaning out my office. That project is well on its way to completion; I’m actually writing this from my new desk, which is nothing but a folding banquet table. I have plans to build some add-ons for it, but it’s working in the meantime. My cleaning has moved on to the bedroom closet and, I’m happy to report, I’ve been joined in that effort by Supportive Partner Woman (Folder of Multitudinous T-Shirts!). 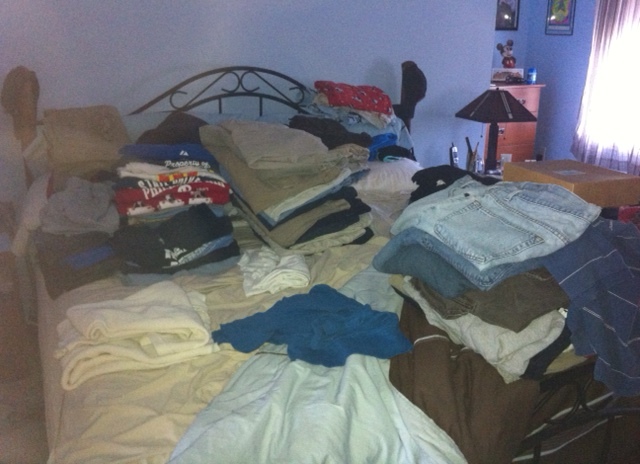 Good God that’s a lot of shirts! We don’t have a lot of pictures of the closet, but this picture should give you an idea of what needed to be refolded and organized. I’m happy to report things look a lot better. I’d like to think that after the procedure is done, I’ll be able to buy smaller clothes. To go along with our improved organization, we’ve been doing more meals at home and meal planning. Just yesterday, I made chipotle-marinated sirloin strips and pico de gallo. 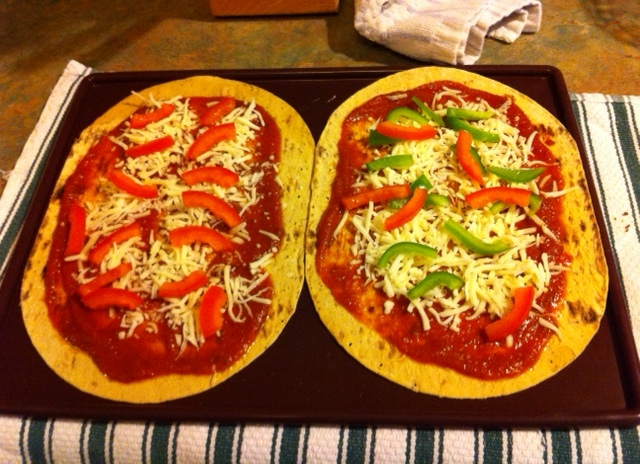 I also used some flatbreads we found at Wegman’s as a pizza crust. I put some jarred pizza sauce (I know..l. need to make my own) and mozzarella on top, along with some sliced Roma tomatoes and, in my case, some green pepper slices. For a first effort, it was actually pretty tasty, and it looked pretty good, too. When I got home from work last night, I also cooked a big pot of black beans for my steak burrito. First time I ever cooked beans that weren’t from a can, so we shall see how they turn out. So, that’s what I have for you today. Remember. You can always make up for calories with flavor. Spices are generally free, so feel free to use liberally. You can make up in flavor what you lose in fat and calories.